It is important to help our children get in the habit of "having a conversation" with a book. This can be done in an age-appropriate way. Give children sticky notes with question marks and exclamation points on them. 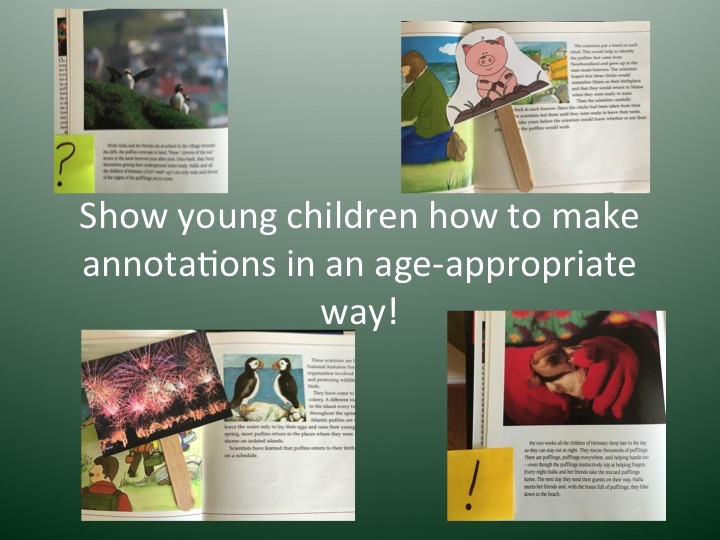 Make a game out of finding the parts that should be thought about again or for sections that children may question. This is the beginning of annotating, a valuable life-long skill we are encouraging in our K-12 classrooms. We also like gluing fun pictures on craft sticks. Fireworks can represent a part of a book that was very exciting. Have questions or not quite understand a part of a book? Is it muddy in your mind? Give children a picture of a pig covered in mud. This makes it silly. Admitting something is not well understood was never so much fun! Then, remember to go back and engage in dialogue about the sections that children marked. The conversation helps with oral language skills. Looking through material more than once gives children processing time with the language. Rich discussions about parts of books that were unclear, exciting, or worth rereading make for valuable oral language practice. NAEYC - 2.D.04 & 2.E.04. Head Start - VII.a. & VIII.B. Close Reading For the Preschool Set!